If you’re starting a food truck business then you already know that it can be difficult trying to choose the best Food Truck Generator to keep everything running. It’s a big decision to ensure that you choose a portable generator that has enough power to operate all of your equipement reliably. When it comes to investing in a food generator I highly recommend spending the extra money in a brand that you can trust, lie Honda, and Yamaha. Quality matters. Generally speaking, the more expensive your generator, the better it is. You’ll never regret spending the extra money because your entire business depends on it. GUIDE | What’s the Best Food Truck Generator? Welcome to our buying guide to help you choose the best food truck generator for your specific needs. We cover a lot of topics in this articles and we review and recommend a range of models depending on the size of your food truck. A generator is essential for a food truck because you cannot rely on power being available everywhere you park your truck. Even if you only need it for backup purposes, it’s worth the investment when compared to losing income. We will review six popular, well-known food truck generators from 2,800 to 9,500 running Watts. You will find a perfect fit for any food truck. All the generators are gas powered, except for one dual-fuel model which can run on propane as well. Three of the generators are quiet, enclosed, inverter models, and the others are standard, open frame, portable models. A food truck owner needs power for a lot of kitchen and business equipment including sensitive electronic devices like a POS system and a cellphone. You also need raw power for those delicious coffees or cold treats that you prepare. It’s not always possible to get clean power and enough watts from the same generator, so I’m going to suggest some alternatives for sensitive devices. The power consumption for a food truck varies and depends on the equipment on board, but our selection will cover all needs. The generator required for each operation depends more on the type of vendor than the food truck size. The owner of a small food truck can easily use more power than one who owns a large food truck that sells hot food and beverages. The size of the truck really depends on the type of business it supports. In a food truck, the heat needed for hot food and stuff is generated using propane gas rather than electricity. They do require electricity for freezers, coolers, extraction fans, air conditioning, lights and office equipment. The required electrical power can be as low as 2,800 Watts. Vending frozen food requires more energy-intensive equipment than any other food type. Condensers are used to produce flavored ice and additional equipment like freezers for cold treats. An air conditioner is a must to keep the inside of the vending area cool in the summer. This requires a large generator to run all the equipment. It can be as high as 9,500 to 12,000 running Watts. When I refer to small, medium, and large food truck generators, it’s not about the size of the food truck or trailer. It’s all about the size of the generator. What happens when the fuel runs out, the generator stops, and you have customers lined up at the food truck? A lot will depend on how you manage the situation, but it’s an important matter to consider. If you run most of your food truck kitchen equipment on propane, you will still have food stuff when the generator stops. However, you will lose lighting, cooling, extraction and the Point of Sales (POS) system. The POS system may include a computer and WiFi router, which must remain operative to avoid a lengthy re-boot process. Equally important, is having clean power for the POS systems and other sensitive equipment delivered from the generator. Most generators cause sensitive equipment to fail and can even destroy this equipment. If your generator does not provide clean power, you need some device to power the point of sales equipment. Some generators now use inverter technology to produce clean power. It’s expensive, works well, and they offer additional value by being a lot quieter. Unfortunately, these inverter generators are mostly available as smaller units. In the review, you will notice that the first three generators are inverter generators but the three bigger ones are not. Another drawback of the inverter generators is the purchase price. Inverter generators cost considerably more than a standard portable generator of the same size. At a specific wattage, it makes financial sense to switch to standard generator technology. However, these generators do not deliver clean power that’s suitable for most office systems. The total harmonic distortion of the power output is too high. An Uninterrupted Power Supply with battery backup seems to be an obvious solution for the sensitive stuff. It can deliver clean power and some backup to the office equipment at the same time. However, from experience, I know that a UPS does not work with all generators. A UPS connected to a running generator can remain on battery and will not connect to the generator power. This is because it too is sensitive to the power it receives. You may need to do one of two things. One solution is to use a small line conditioner for the electronic office equipment without a backup UPS. A typical line/power conditioner offers Automatic Voltage Regulation (AVR), AC Surge Protection, and 6 Outlets. You will not need more than about 600 Watts and 120V power is all you’ll need. It protects sensitive electronics powered by a generator, prevents surges and spikes from damaging circuitry and filters out disruptive line noise from the generator. It’s Ideal for routers, modems, printers and point-of-sale equipment. Alternatively, you can provide clean regulated power with a power conditioner and connect the UPS to that. The UPS is now on clean power and will no longer detect the generator, so it will function normally. The outcome is positive, the AC current from the line conditioner is clean and regulated, protecting the POS equipment from generator inaccuracies. Adding a UPS to the line conditioner will keep your POS systems up and running while you refuel the generator. Small Food Truck Generators — up to 4,000 running Watts. The perfect little travel trailer/RV generator. You can run 2 in parallel. Note : I highly recommend the All Terrain Wheel Kit for the Honda EU3000iS. This generator weighs 131 lbs., you don’t want to be carrying it around. Honda really should integrate these wheels into the generator. Powers most furnaces, fridges, microwaves, 13,500 BTU/h RV AC units, great for your RV. Can power a wide range of appliances, including a furnace, fridge, microwave, and most 13,500 BTU RV AC units. Whisper quiet inverter generator – less noise than normal conversation. EU3000iS operates at 50 to 57 dB(A), Ideal for camping, RV power and any other activity that requires quiet operation. Electric start : Reliable recoil starting is available as a back up. Fuel efficient – Runs up to 20 hours on 3.4 gal of fuel. Runs from 7.2 to 20 hours on a single tank, depending on the load. It can run all night. Stable, clean power. Produces power as reliable as the power you get from your outlets at home. Oil Alert : Protects the generator by shutting the engine off when your oil is low. ✓ View or download the MANUAL for the Honda EU3000iS. 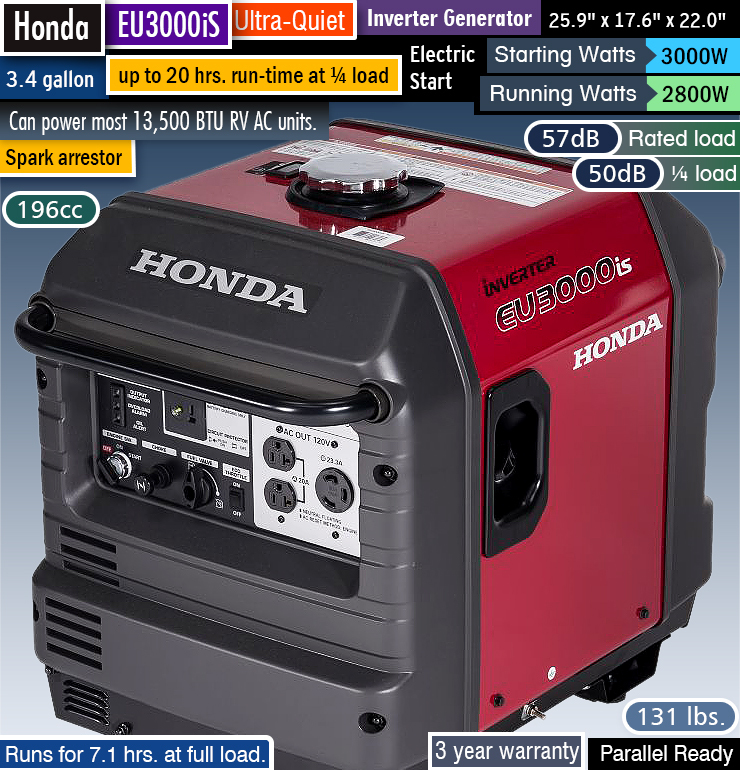 The first small food truck generator I’ll review is the Honda EU3000iS with 3,000 Starting Watts and 2,800 Running Watts. The fuel capacity of this portable inverter generator is 3.4 gallons. Delivering 100% of its 2,800 Watts, it will run for 7.1 hours. The run-time at 25% of the rated output is 20 hours. You will find that most generator manufacturers give us this somewhat meaningless 25% specification. Especially when used with a food truck, the only relevant run-time figure is at 100% of the rated output. The equipment used in the food truck remains on while trading and only the change in startup current will affect the load. I don’t think anyone is content with buying something and only using 1/4 of it. A Generator is more likely to be used at 90% of its maximum load most of the time. The rating that I use to indicate the fuel efficiency of any generator is the kilowatt-hours per gallon rating. For generators, kilowatt-hours per gallon relates to miles per gallon specifications for a car. For the Honda EU3000iS, it is a respectable 5.85 kWh/gal. It’s the reason why we get a good runtime of 7.1 hours on only 3.4 gallons of fuel. It’s comforting to know that this fuel-efficient generator will keep your fuel bill as low as possible over years of trading. When calculating the power needs of a food truck, you add up the combined running wattage for all of your equipment. To that sum, you add the startup current of the device with the highest load. The final figure is the starting wattage for the generator you need. The total running wattage of your equipment must not exceed the running wattage of the generator. You may find that the limiting factor can be the difference between the operating current and the starting current. Even a small refrigerator/freezer needs a substantial overhead current and, when combined with a microwave, it will cause the greatest fluctuation. The Honda’s starting current of 3,000 Watts will most likely be the limiting factor. I consider 2,000 to 3,000 Running Watts as a safe minimum when buying a food truck generator. If your power needs meet that of the Honda, it’s a safe match. Making it an excellent choice. The Honda is a reliable machine with a good reputation. It’s a quality generator that can work hard all day. The Honda delivers 120 Volts only, but it is a clean, pure sine wave current from a built-in inverter. This is an advantage over conventional generators in that it is POS (point of sales system) ready. It means that the current output from the inverter will not damage sensitive equipment. Your POS system may include a computer, Wi-Fi router, cell phones, and credit card facilities. It is possibly the most important hub of your business and must be up and running without any hitches. Having clean reliable power is a must. However, if your trading hours exceed the 7-hour runtime of the Honda, a re-fuel is inevitable. To ensure that you’ll be able to carry on trading you may need a small UPS to keep the POS systems running while you’re refueling. Because the Honda EU3000iS is a 120 Volt only generator, it is only compatible with a food truck equipped with 120 Volt equipment. It will connect to the food truck using a 120 Volt 3-Prong Twist Lock (L5-30) connector. With its ground terminal and neutral bonded to the frame of the generator, the connection should be safe. It is also heartening to know that the Honda generator delivers a full 30 Amps to this outlet. Another advantage of an inverter generator is the lower noise levels than open frame models. The noise generated by the Honda is only 57 dBA at 23 feet when measured at 100% load. That’s the same as a discussion between two people. It will not interfere in your interaction with customers. You must consider the size and weight of the food truck generator. When you move the operation, you’ll have to find space for a generator which is 25.9″ long by 17.6″ wide and 22″ tall. The weight of this generator is a bit too much for a single person to pick up and load through a single door opening. It weighs 130 pounds. This problem can be solved by using the 2 or 4-wheel kit that is available as an option. With the generator outside and some distance away from the food truck, it’s good to know that the outlet covers will protect them from dust and moisture. This generator is not a dual fuel machine, it can be used on gas only. It is not a negative point though. Most food truck vendors use gas generators anyway. The Honda does not provide any indication of output levels or run time. I really like a generator that gives you an indication of the remaining runtime and the immediate and average wattage used. Even fuel consumption in gallons per hour would be handy. It does have parallel-operation outlets, enabling you to connect two of these Honda generators in parallel. In doing so, you almost double the power output with only a small loss. You will have to use a parallel kit supplied by Honda to do this. It can be a great way of adding more power when the need arises. A handy direct current (DC) 12 Volt, 8.3 Amp outlet on the control panel is available for charging batteries. It could be a lifesaver if your truck battery fails. A built-in fuel gauge is a handy addition that is useful to determine the real expected run time of the Honda. You’ll probably be monitoring this gauge for quite a while until you understand the fuel consumption trends of the generator. To start the Honda generator, you use a manual choke and the convenient electric starter. An onboard battery, that’s charged when the generator is running, powers the electric starter. Should the electric start feature fail, you can use the recoil starter. When stopping the generator, you use the convenient twist on/off lever of the fuel valve on the control panel. It is positioned in clear view, which is an advantage. It’s so easy to forget a hidden fuel shut-off valve in the closed position when starting the generator. This little fuel-efficient generator also has a low oil shutdown feature that will protect the engine from failure when the oil runs low. It is also good to know that the generator has the necessary Spark Arrestor and all the required Emission Certification. Easy to read meter indicates the amount of power being used. Suitable for running most 15,000 BTU RV air conditioners and 1000 watt microwave oven, or two major RV appliances simultaneously. Quiet, portable package. Designed for maximum fuel efficiency and minimum noise, its super-powerful engine allows it to run at the very low engine speed of just 2600 rpm – 1000 rpm lower than other generators it its class. Reduced fuel consumption as well as less noise, vibration, and engine wear. Up to 15.2 hours run time ant 1/4 rated load. Noise Block sound reduction system which makes it a very quiet generator for its output. 58-60 decibels. 4500 watt maximum output, 4000 watt rated continuous output ‐ Suitable for running most 15,000 BTU RV air conditioners and 1000 watt microwave oven, or two major RV appliances simultaneously. Noise Block sound reduction system ‐ Very quiet 58-60 decibels. Low speed running ‐ Using the most powerful engine in its class to run at a constant ultra low speed of 2600 rpm to reduce gasoline consumption, extend running time between refueling and reduce noise and engine wear. 50 state legal ‐ Meets CARB emission regulations and given highest EPA rating. Pulse Width Modulation Inverter System ‐ Sine wave as clean as or cleaner than household electricity. Suitable for computers, televisions, satellite TV systems and other sensitive electronic equipment and appliances. Optional wireless remote control ‐ Start and stop the generator from up to 66 feet away. Electric start ‐ Effortless turn the key to star. Automatic choke ‐ Easy starting even in cold climates. Low oil warning system ‐ Shuts the engine off to protect the engine if the oil level drops. Power meter ‐ Easy to read meter indicates the amount of power being used and the amount that’s available. Hour meter ‐ Displays the amount of running time accumulated to indicate servicing or refueling interval. Twin bar ‐ Aids in lifting and loading. Also utilize for transport and anti-theft security. Gas gauge ‐ Indicates amount of gasoline to indicate refueling interval. Factory warranty ‐ Covers the entire generator for defects in parts and workmanship for three (3) years. Stylish design ‐ Attractive and practical. Four wheels with parking brake ‐ Easy transport and security. The Yamaha EF4500iSE with 4,500 starting, and 4,000 running Watts is another quality generator that you may consider. It’s a perfect fit for a food truck that needs more power than the Honda’s 3,000 Watts. Although I must point out that the difference between the startup current and running current is only 500 Watts. It means the generator will not run near its full running Watts capacity due to the much bigger starting Watts requirements with some food truck equipment. It is important to note that this is another 120 Volt generator so it will not power any 240 Volt appliances. It can be a perfect fit or many food trucks though. Some trucks rely heavily on propane gas to supply heat and only need a generator for a freezer, lights and POS system. The Yamaha has a fuel capacity of 4.5 gallons. Its run-time is 15.2 hours at 25% of the rated power. It sounds like a reasonable time, but the food truck will most likely use a lot more than 25% of 4,000 Watts. That’s only 1,000 Watts, so we need to determine the consumption at full power. At the given 15.2 hours at 25%, the calculated fuel efficiency is 3.38 kilowatt-hours per gallon. Using that information, I calculated the fuel consumption at 100% power to be almost the same as the 3.75 hours reported by a food truck owner. Therefore, I accept that 3.75 hours is a reasonable run-time for the Yamaha at 100% load. Not good, I expected a lot better. The Yamaha offers more power than the Honda, but with 3.75 hours run-time, a small UPS is necessary to keep the POS systems running. In line with my assumption that you will not likely use the generator at 100% power, I also calculated the runtime at 75% power. It turns out that the runtime will be a lot more reasonable, it will run for roughly 5 hours. None of these figures are accurate of course, it is merely a guide to what you can expect to get. A lot depends on the load, the customers, and even the weather. Because this is an inverter generator, its power output is clean and fit for use with sensitive equipment. It is therefore, POS systems friendly, and will power an inline UPS successfully. Apart from the need to refuel more often, it is still a good generator for a food truck vendor. Yamaha has a good support structure with a good reputation, it is quiet too. The noise level reading of 60 dBA at 23 feet is excellent for a 4,000-Watt generator. To fit this generator on your food truck, you need space for a unit that’s 30.7″ by 24.3″ by 27.2″ high, supported on four lockable wheels. The generator weighs 194 pounds, that’s more than my own weight, you may need a small ramp to load it into/onto the food truck. On level ground or when loaded into the food truck, it moves easily on the four small wheels. The Yamaha EF4500iSE is fitted with a user-friendly interface panel with all the controls and outlets. One 120 Volt AC, 30 Amp Receptacle (NEMA TT-30R) and Two 120 Volt AC / 20 Amp connectors are available. The 30 Amp outlet is the one you will use, and a 33 Amp trip switch protects it. It has an overload indicator that will light up when the generator is overloaded. After four seconds, it shuts down power. Its ground terminal and neutral is bonded to the frame. You should consult with an electrician to ensure a safe connection to the food truck. The power outlets are neatly grouped on the interface but have no weather covers for protection against the elements. Over time, the connections may become contaminated by dust and moisture that can create a non-conductive layer, creating resistance to current flow. Yes, you guessed it, I once had a connection that did not work anymore because of this sort of corrosion. I started using outlet plug covers, these covers are sold as childproof safety caps that will also make the generator outputs safe. When using the generator in wet weather, it is better to have an all weather cover. So, even though these covers will not keep the outlets dry the canopy should do that. For those rainy days when the customers line up for comforting coffees, you cannot merely use the generator outside without some sort of protection. I recommend using a GenTent Safety Canopy, it will protect the generator against rain and snow. To assist with maintenance records, the power and hour meter is a handy tool. With the built-in gauge on the fuel tank, you can monitor the load/consumption of the generator. The Yamaha EF4500iSE does not have parallel operation outlets like the Honda, so its power output is limited to the 4,000-Watts running power. The power output of this generator should be a good match for your food truck. Even though it may run at close to full power, I do not foresee a need for doubling up the power, unless the operation changes. One shaved ice concession vendor says he uses a 13,500 BTU air conditioner, chest freezer and a hot water heater. Additionally, there are numerous small accessories along with the business and lighting. He still has power to spare. The generator does not have a direct current (DC) output, but the electric start makes starting effortless. You turn the key to start the generator, and you can add an optional wireless remote control to start at a distance. The automatic choke will ensure easy starting even in a cold climate when using the remote start. The fuel shutoff valve is on the control panel, in plain sight so you will not ignore it during startup/shutdown. Yamaha’s oil watch warning system has a low oil warning light and automatic engine cut out to prevent engine damage. The generator is legal in 50 states, meets CARB emission regulations, and it has the highest EPA rating. You will notice that the bigger a generator gets, the gap between starting power limits and running power will also increase. This makes it easier to match the generator to the demands of the food truck. The point being that the cooling equipment, extractor fans, etc. need a lot of additional power for equipment that is starting up regularly. The rest of the generators under review do have this larger gap between running current and starting current. Compact and powerful inverter generator — 6500W/5000W (starting/running) QuietPower. with Briggs and Stratton Engine. Best food truck generator for medium-sized truck. 60% quieter than standard generators. All-steel frame enclosed in a protective shell, noise is reduced greatly and internal components are protected from the elements. A suitcase-style telescoping handle makes it easy to move the generator anywhere you need to go. ✓ View or download the MANUAL or the QUICK START Guide for the Briggs & Stratton Q6500. The Briggs & Stratton Q6500, QuietPower has a starting current of 6,500 Watts and running current of 5,000 Watts. Considering its power output, and that it’s an inverter generator capable of delivering 240 Volts at 20.8 Amps. It’s an ideal match for many food trucks. The Briggs & Stratton’s Fuel capacity is 5 gallons. The specified run time at 25% is 14 hours, and that gives us 3.5 kilowatt-hours per gallon. The 100% power run-time is not given. Based on the 25% runtime, I calculate it to be about 3.45 hours. It means that you will have to refuel during a typical workday. To assist with determining the available run time, the Built-in Gauge on the Fuel Tank will come in handy. The need to refuel necessitates a UPS for the business equipment. The next three generators we review deliver more power for less money than the Briggs & Stratton. They also offer better fuel consumption and longer runtimes. However, you will need a power conditioner to modify the generator power delivered to the office equipment. It’s not a huge drawback, and we will discuss it lower down. Quiet home back-up power engineered to be quiet and efficient. This is a compact generator. It is about the same size as the Honda EU3000iS and more compact than the Yamaha, I think it will comfortably fit into most food trucks. One 120/240 Volt AC, 30 Amp Twist-Lock Receptacle (NEMA L14-30R) and two Dual 120 Volt AC, 20 Amp GFCI Duplex Receptacles are fitted. I do not recommend using an RV adapter in the twist lock outlet to connect to a 120 Volt food truck. Because it is limited to 20.8 Amps, it will only deliver 2,500 Watt of continuous power (120V / 20.8A). You have to ensure that you match the food truck voltage to the voltage of the generator. Two USB ports are available to charge devices. It may come in handy if you’re comfortable with leaving your devices at the generator, 23 feet away, while you are serving customers. The outlets are all protected with covers, so there is no need to purchase childproof safety caps. Four Power output LEDs indicate 25%, 50%, 75%, and 100% power usage. It’s a rough guide, but still handy to determine the load at a quick glance. The Briggs & Stratton does not have Parallel operation outlets so you cannot parallel it with another Briggs & Stratton generator. It means that you are limited to the capabilities of the generator. To expand, you’ll have to replace it. A Direct Circuit (DC) output for charging batteries is included. The Manual-Choke and the engine switch are neatly grouped together on the control panel and right next to the recoil starter. This generator does not have an electric start function, you have to use the recoil starter. For a rather big generator, I am surprised that it is not fitted with a starter, yanking a big generator to life can be hard work. The absence of a battery and starter motor has the advantage of making the generator lighter and somewhat more portable. The Briggs & Stratton Q6500 only weighs 138 pounds, eight more than the Honda EU3000iS. It may be advantageous for some vendors. Personally, I would prefer to have an electric starter. The fuel tank has a built-in gauge allowing you to determine the refueling intervals. You can remove the regulatory Spark Arrestor in the muffler when desirable to clean or replace it. The generator has all the necessary Emission Certification, so it is legal in all states. A Low Oil Shutdown system will protect the engine by stopping it when the oil level is too low. Portable Generator with Remote Electric Start – 7500 Rated Watts & 9500 Peak Watts – Gas Powered – CARB Compliant. A workhorse generator. Well-made, affordable, and reliable. Should be at the top of your list for best food truck generator. A true workhorse generator. Well-built & affordable. ✓ View or download the MANUAL for for the Westinghouse WGen7500. It’s a big jump from the 6,500 Starting Watts of the Briggs & Stratton to the 9,500 starting Watts of the Westinghouse WGen7500. The 7,500 running Watts of the Westinghouse is even more than the starting Watts of the Briggs & Stratton. Yes, the Briggs and Stratton is an Inverter generator, looks smart and it is quiet. On the other hand, if you buy a Westinghouse and add a power conditioner along with a small UPS, you still save some money to spare. You will also have a lot more power and an electric starter with a remote. The runtime is longer at 4.93 hours at 100% rated power. The generator is more fuel-efficient too, so you’ll save on your fuel bill. The only disadvantage is that the Westinghouse is not as quiet. The fuel capacity is 6.6 gallons, providing 11 hours at 50% load and should run 4.93 hours at 100% load. Its fuel efficiency is therefore 5.68 kilowatt-hours per gallon. The Honda is the most fuel-efficient inverter generator, and it is even better than the standard Westinghouse and Cat generators. The Yamaha and the Briggs & Stratton inverter generators are the least fuel-efficient of all generators in our review. The Duromax XP12000E is the winner in terms of fuel efficiency. Fuel consumption is an essential consideration for a food truck vendor; the Westinghouse will consume 6.6 Gallons in 5 hours. Its noise level at 73 dBA at 23 ft. is also not too bad, even if it is the best possible reading. Unfortunately, bigger generators are noisy and heavy, this one weighs 192 pounds. Surprisingly, it is two pounds lighter than the Yamaha, shorter and wider than the Yamaha and an inch higher. Unlike the Yamaha, it has two 10″ wheels and folding handles for moving it around. As I mentioned, its power output has too much line noise for sensitive systems like your POS systems. Its Total Harmonic Distortion (THD) is < 23%. For a POS system, you would expect to have an output of less than 5% THD. It is possible to “clean out” the power from the generator by using a power conditioner. Power conditioners are also known as line conditioners, they also regulate the output voltage and filter out any power spikes. The solution I’m proposing is to use a small It is used in-line with the office equipment only so a big unit is not required. If the almost 5-hours runtime that you get from the generator is not enough, you may consider a UPS for the office equipment as well. Compared to the Briggs and Stratton solution you will still have some pocket money too, it is therefore, a viable solution. (2x) Duplex 120V 20A GFCI (5-20R) outlets protected by rubber covers. The ground terminal and neutral are bonded to the frame for your protection. The user interface has a Datacenter which displays either Volts, frequency, or lifetime hours, depending on the selection. A Direct current (DC) 12V DC output is available to charge batteries. The onboard battery is charged by the generator when it’s running. The battery provides an electric start facility with a remote Start Key Fob. The 6.6-gallon fuel tank has a built-in Fuel Gauge that will make it possible to dash out and quickly determine how long the fuel will last. The generator uses an automatic choke, and you use a manual fuel valve when you turn the generator off to let the carburetor run dry. It’s always a good thing to do when you transport a generator and a must when you prepare it for storage. Unlike the fully enclosed generators, like the inverter generators, the choke and fuel cut-off are not on the control panel. The fuel shut-off valve is at the carburetor. You can remove the regulatory spark arrestor in the muffler to clean or replace it. The generator has all the necessary emission certification, so it is legal in all states. The engine is protected by a low oil shutdown system that will stop it when the oil level is too low. The Westinghouse is a good choice for a food truck operation. For an open frame generator, noise levels are fairly standard, though it’s certainly not a silent generator. It has all the power you’ll need for most of your worksite needs at a price that’s hard to beat. All the safety features are there and with the addition of a power conditioner it delivers clean power. The combination of robust design and superb functionality has made the WGen7500 one of the most sought-after generators in its class. Learn more about Westinghouse generators by visiting their website. They’ve been in business since 1886 so you can trust that your money goes a long way with their products. Truly, a fantastic brand that we love. CAT generators are built to very high standards. Also available — ✓ Standard Model : NOT CARB Compliant Model : Cat RP7500E (490-6491). If you live outside of California and you want to save some money then buy the standard model. It’s EPA compliant. View or download the MODEL COMPARISON for all of the Cat RP Series generators. View or download the Caterpillar generator WARRANTY. The CAT RP7500E is comparable with the Westinghouse in power output. It delivers 9,375 starting Watts and 7,500 running Watts. Its fuel tank is bigger than the Westinghouse. The Cat has a capacity of 7.9 gallons. It has an 11-hour runtime at 50% of its rated output. I calculate its runtime at 100% load to be about 5.43 hours. Due to the big gap between the starting and running Wattages, it is possible to run the Cat at close to its rated output constantly. The RP7500E is less fuel-efficient than the Westinghouse, but not by much. Its fuel efficiency works out at 5.22 Kilowatt hours per gallon. Because of its bigger fuel tank, it has a longer runtime. The improved runtime is an advantage. If your trading hours are less than 5¾ hours, you may not even need a UPS for the office equipment. Cat does not specify the THD of the Cat RP7500E. I think it will not be <5% and therefore , it is necessary to use a power conditioner on the lines used for the POS systems. The power requirements for the power conditioner will be determined by the office equipment. If you use modern equipment, only the printer will have a small startup current. The CAT is a little noisier than the Westinghouse. Although it’s only 1dBA more. At 74dBA, it will be as loud as a freeway at 50 feet from you. Due to a lack of information, I do not know at what output it is quoted. It may be a consideration to have it behind the food truck, away from the service area. Then the truck could act as a sound shield. Surprisingly, the Cat is more than 5 inches longer than the Westinghouse. It is 32.87″ long and 27.4″ wide, a little more than an inch wider. It’s only 24.72″ high and weighs an uncomfortable 205 pounds. All these big machines are somewhat difficult to move around and load into a confined space. Even if you transport it at the back of the food truck, you should consider using a small ramp for loading it. (2x) GFCI 120 Volt AC / 20 Amp duplex (GFCI 5-20R) outlets. All of them are protected by weatherproof outlet covers. The Cat also has a convenient 4 in 1 digital display for voltage, frequency, running hours, and total hours to monitor what is happening. This machine does not have parallel operation outlets so you cannot expand it when the need arises sometime in the future. Neither does it have a direct current (DC) output that can be used for charging batteries, although it charges the starter battery. The electric start control does not have a remote start feature. To start the engine; you pull out the manual choke and turn the stop/on/start switch to start the engine. The fuel control valve is located in close proximity to the start control, ensuring that you do not forget to turn the fuel on. An interesting feature on the user interface panel is an LED panel lights to make the controls visible at night. It makes a lot of sense if you use the generator during night time. The fuel tank has a built-in gauge that you can use to estimate the next refuel. The generator’s emission certification is legal in all states. This generator is also fitted with a low oil shutdown system that will stop the engine when the oil level is too low. Learn more about CAT generators by reading our comprehensive buying guide to CAT generators. Your best friend during a natural disaster. Full power panel with oil warning light, volt meter, circuit breaker and power outlets. Vending frozen food requires more energy-intensive equipment than any other food type. Vendors selling frozen treats use more power than the ones selling hot foods. This is because heat is generally generated using propane. Starting current 12,000 Watts or 50 Amp at 240 Volt. Running current 9,500 Watts or 40 Amp at 240 Volt. When powering a 50 Amp food truck, it will have the ability to give you 9,000 Watts running current. While it may deliver up to 12,000 Watt starting current, 40 Amps running current per leg is what this generator can deliver. When using it with propane, the starting current is 42.5 Amps, but it will still power the air conditioner, extractor fan, and the most essential appliances. However, you will quickly learn which appliances will work with the reduced output. But even on propane, it is a suitable power source for a food truck requiring 50 Amps. A switch on the DuroMax generator selects one of two output voltage settings. In the manual, it is referred to as Power Boost Technology. If you select “120V ONLY” it will only power the 120 Volt outlets and one leg of the 240 Volt connectors. If you only connect 120 Volt appliances to the generator, you select the “120V ONLY” position. It doubles the 120 Volt amperage and automatically balances the loads on the generator windings. If you use 240 Volt appliances with the 4-prong 50 Amp receptacle, the switch must be in the “120/240V” position. The DuroMax is heavy; it weighs 269 pounds, so I tend to refer to it as a luggable, rather than a portable generator. A robust, open frame structure supports and protects the generator, engine and other components. It’s also fitted with two 10-inch wheels that are mounted on the balance point to make moving it around more convenient and comfortable. It has two fold-down handles for lifting the other end when moving it around. You must assemble the generator and install the supplied battery before you can use it. The battery powers the electric starter, and the generator maintains the battery charge. It will not drain during storage because an on/off switch disconnects the battery from all circuits. On the control panel of the generator, you will find three round output receptacles, which provide all the flexibility you need. A 4-prong 120/240 Volt 50 Amp receptacle (NEMA L14-50R) that will be the connection you will most likely use with a food truck. Additionally, there is the 120 Volt 3-Prong Twist Lock (L5-30) used for 120 Volt appliances. A 120/240 Volt AC, 30 Amp 4-prong Twist-Lock (NEMA L14-30R) also found on all the other generators that we looked at. Two house style outlets provide GFCI protected 120 Volt AC / 20 Amp Duplex (GFCI 5-20R) power. Overcurrent circuit breakers protect all the outlets against overloads. In addition to the AC connections, a 12 Volt 8.3 Amps DC connection uses DC+ and DC- mounting posts. DuroMax supply a set of DC charge cables with the generator to charge 12 Volt automotive style batteries or small DC appliances. I’m a bit disappointed to see that rubber covers do not protect the outlets. It keeps them clean and protects small children who may be tempted to insert things. All the outlets are grouped together on the user interface panel and looks neat and convenient. The controls and the circuit breakers on the generator are clearly marked. You use a key to switch the generator on, or off, and to start it. An idle control switch engages the fuel-saving feature that lowers engine speed when the generator has no load. A ground terminal on the interface panel bonds neutral to the frame of the generator. You use it to ground the generator to an earth spike. A novel voltmeter provides a reading of the voltage output of the generator. No Parallel operation outlets are provided on this type of generator, what you buy is what you get. It cannot be expanded or doubled up. A manual choke is used to start the engine from cold. It is not situated within clear view, but it is indicated on the frame. The fuel valve that’s used to turn off the fuel during the changeover to propane, and when shutting down, is at the carburetor. The fuel gauge on the gasoline tank is a handy addition that makes it possible to estimate the available runtime. It’s necessary because a generator that uses gasoline has to be stopped and allowed to cool a bit before refueling it. When the DuroMax XP12000EH generator is running off of gas, it delivers 9,500 Watts running power. Its fuel efficiency is 6.01 Kilowatt-hours per gallon, which is excellent. It’s the biggest generator in our review and the most fuel-efficient of all. The tank holds 7.9 gallons, and with a 100% load the runtime is about 4.93 hours. The propane connection and regulator is at the rear of the generator. Switching over to propane is not as easy as turning a selector, it’s little more complicated. However, the instructions in the owner’s manual are clear and precise. It will run on propane for 5 Hours at 100% load using a standard BBQ tank size (5 gallons). Keep in mind that the output drops to 8,075 Watts when you use propane. On the plus side, the engine runs cleaner and starts immediately on propane. A propane tank is not supplied with the dual fuel generator. Unfortunately, the noise levels of these big open frame generators are high. To make it quieter, it has a quiet muffler that reduces engine noise. The noise level of less than 74 dB at 23 feet is like a freeway 50 feet away at 10 a.m. When standing next to the generator, the noise is unbearable. Keep this in mind when positioning the generator. The DuroMax is fully EPA and CARB compliant. So you may use the generator in all fifty states. The spark arrestor is USDA Forest Service approved. A low oil shut-off switch protects the engine, should it run out of oil. An oil warning light will indicate when this happens, a useful aid for troubleshooting. The generator has received excellent customer feedback, including positive response regarding propane consumption during lengthy power outages of 4 days and longer. This big generator may be difficult to transport with a food truck, especially when space is limited. It is 28″ long with the handles folded down, 22″ wide and 23″ high. It is heavy too. Weighing 269 pounds, it is not an easy beast to handle and load into a confined space. You must make sure that it will fit into your vehicle. All the required safety equipment like a spark arrestor is installed and all emission certification is available. If you want to learn more read our dedicated review of the impressive DuroMax XP12000EH. Determining the generator size needed for a food truck that is already fitted out is easy. You will start by looking at the power receptacle on the outside of the truck. A food truck fitted with a 30 Amp connector will need a 30 Amp generator. Any connector that has a NEMA 14-30R, L14R or any connector with 30R in its number will do. A NEMA TT30 is another possibility. If it is fitted with a 50 Amp socket, you will need a 50 Amp generator. The receptacle will be marked, possibly NEMA 14-50. We recently did an article on 50 Amp generators that you will find handy. It explains how these generators function and how they differ in real power output. An already fitted food truck will also have the necessary papers, and it is another source of information.